A summit earthquake swarm with focal depths of <10 km was recorded 4-5 May 1987 (table 9-1). Epicenters were <15 km from Yuzhno-Kurilsk seismic station (12 km from the volcano). Repeated measurements 25-28 September in a borehole 10 km from the summit registered temperatures 4°C higher than in 1986 at a depth of 74 m. Temperatures increased 4-5°C in some hot springs on the E and S flanks. 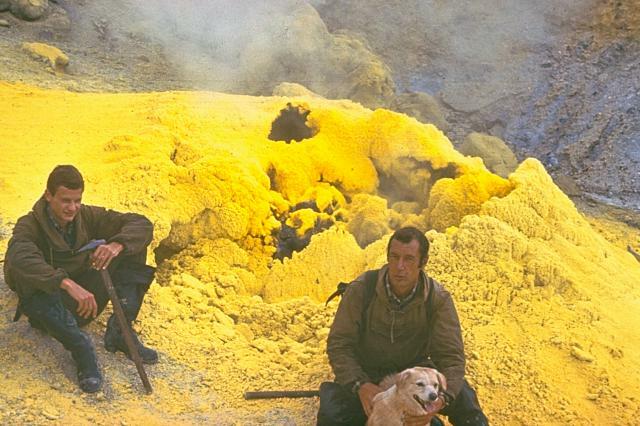 Fumaroles in the same area showed essentially no variation from 1986; vapor emitted under pressure had temperatures of 97-107°C. . . . the earthquakes seemed to be caused by exploitation of geothermal wells, used for heat production. The Global Volcanism Program has no Weekly Reports available for Raususan [Mendeleev]. In the explosive crater area on the volcano's E slope intense fumarolic and solfataric activity was occurring during a 6 November aerial survey. 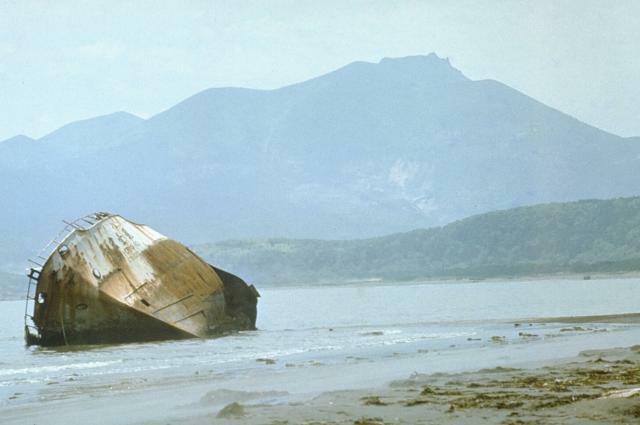 Raususan, also known as Mendeleev, is a low compound stratovolcano located in the southern part of Kunashir Island. The dominantly andesitic-dacitic volcano is cut by two nested calderas, the larger 6-7 km in diameter and the smaller 3-3.5 km. A central cone that formed inside the younger caldera was breached to the west by a large debris avalanche about 4200 years ago. A lava dome that grew inside the avalanche scarp forms the 888 m high point of the volcano. Additional lava domes in the northern part of the older caldera are considered to represent flank activity of the younger caldera. The only unambiguous historical eruption was a small phreatic explosion in 1880. Four solfatara fields lie at the eastern and northern flanks of the central cone, and a geothermal field is located outside the caldera along the eastern coast. There is no Deformation History data available for Raususan [Mendeleev]. There is no Emissions History data available for Raususan [Mendeleev]. The last major eruption of Mendeleev volcano, about 4200 years ago, was similar in several regards to the 1980 Mount St. Helens eruption. Collapse of the central cone produced a debris avalanche and left a horseshoe-shaped crater breached to the west. Pyroclastic flows accompanied growth of a lava dome in the new crater. 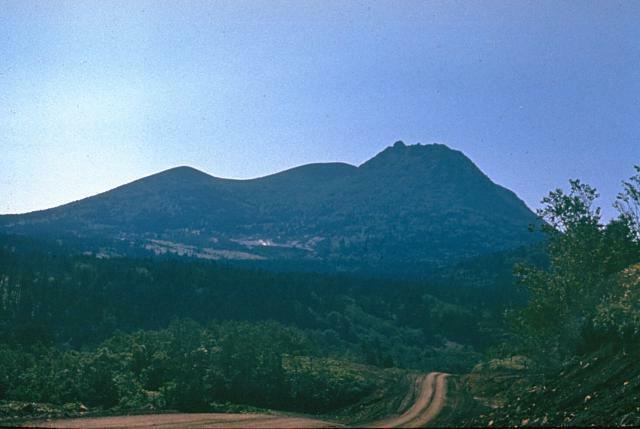 This dacitic dome (right) forms the 887-m high point of Mendeleev volcano. Steam rises above a NW-flank fumarolic area (center), one of several thermal areas on the flanks of the central cone. Mendeleev, also known as Rausu-dake, is a compound stratovolcano with two nested calderas, the larger 6-7 km in diameter and the smaller 3-3.5 km. A central cone that formed inside the younger caldera is seen here from the east, near the settlement of Yuzhno-Kurilsk. The only unambiguous historical eruption was a small phreatic explosion in 1880. The Goriachy Pliazh geothermal field is located outside the caldera along the Pacific coast. 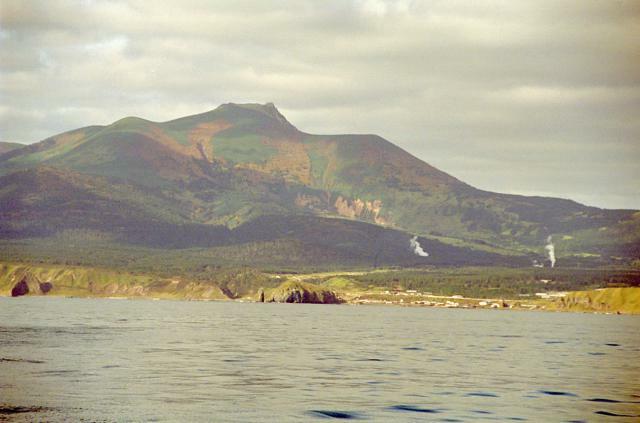 Mendeleev volcano on the southern part of Kunashir Island towers above the village of Yuzhno-Kurilsk. Steam plumes rise above geothermal wells on the volcano's NW flanks, in one of several geothermal fields flanking the volcano. The volcano seen here lies within a 6-7 km wide caldera. The only unambiguous historical eruption from Mendeleev was a small phreatic explosion in 1880. There are no samples for Raususan [Mendeleev] in the Smithsonian's NMNH Department of Mineral Sciences Rock and Ore collection. Large Eruptions of Raususan [Mendeleev] Information about large Quaternary eruptions (VEI >= 4) is cataloged in the Large Magnitude Explosive Volcanic Eruptions (LaMEVE) database of the Volcano Global Risk Identification and Analysis Project (VOGRIPA).